The cool temperatures and falling leaves leave no doubt that fall has arrived. But before our thoughts turn to the winter months ahead, it is a great time to look back at the recently completed third season of Bike Fun with Poky Pedaling Stevens Point. 2014 was an extraordinary year for PPSP. Poky Pedalers shared Bike Fun on 13 Poky Pedals, all of which were new except for the encore Influential Citizen Ride. These averaged more than 24 Poky Pedalers each, almost double the number of Poky Pedalers per ride from PPSP’s first two years. There is a common catchphrase about wanting to attract 8- to 80-year-olds to bicycling. PPSP did better than that, attracting 7- to 90-year-olds on Poky Pedals this year. Poky Pedalers included families with young children – some in trailers and some (as young as 7) riding their own bikes, 20-somethings, 40-somethings, 60-somethings, and – notably among the rest – a 91-year-old gentleman. One is never too old to share Bike Fun. We rode all over Stevens Point and beyond. 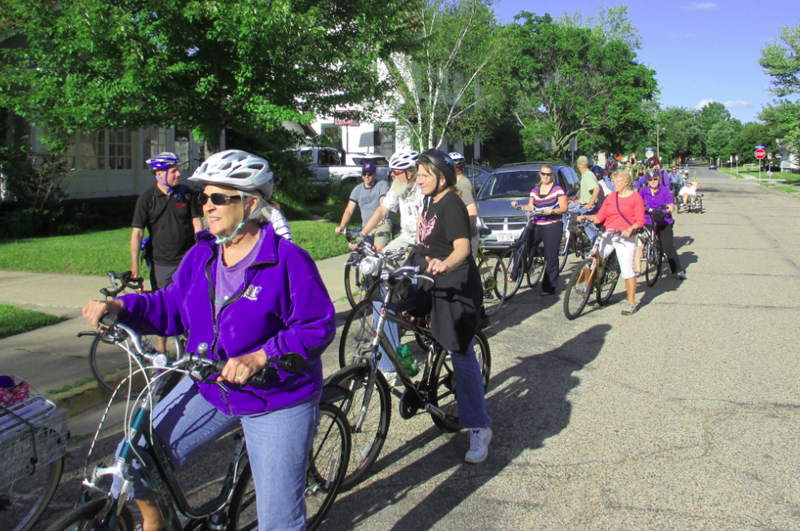 Our Poky Pedals took us west of the Wisconsin River and throughout the Village of Whiting. We would have ridden through Plover, but bad weather cancelled the Maple Ride (sniff). After 32 Poky Pedals over 3 years, that was the first time we had to cancel. Sad, yet we have generally been fortunate to have good weather for our Bike Fun. The Chocolate Ride created a new standard for Bike Fun. 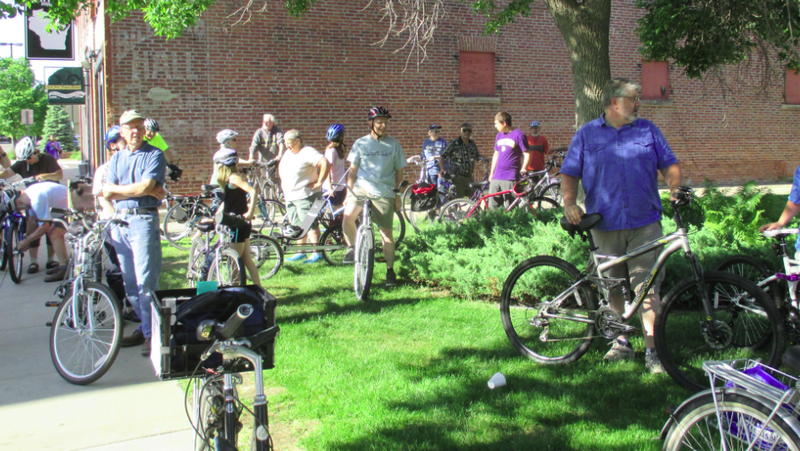 A record 39 Poky Pedalers participated as we rode a 9-mile loop with stops to sample chocolate truffles, Death by Chocolate Cake, chocolate cheese, and chocolate frozen custard. The first year of monthly Poky Pizza Pedals were a big hit. These four extremely popular rides started from Point Area Bicycle Service in downtown Stevens Point. Each was a 4-mile loop within 4 different regions of the city and ending at 4 different pizza places. We had a special guest join us on one Poky Pedal this year. Dave Cieslewicz is the Executive Director of the Wisconsin Bike Fed, a former 2-term mayor of Madison, and a founder of 1000 Friends of Wisconsin. He shared Bike Fun with us and gained personal experience about Poky Pedalers in the Stevens Point area. I had the opportunity to communicate with him afterwards, and he was truly impressed by the diversity of bicycle riders attracted to PPSP. Garnering this level of attention is certainly good for making bicycling better in and around Stevens Point. On the Poke-Around Ride – Village of Whiting, we visited the site of the original Whiting School and Village Hall and saw the school bell that had hung in its cupola. We also learned about McDillville, George Whiting, and the controversial vote in 1947 that named the village Whiting instead of McDill. The Influential Citizen Ride again recounted biographies of the ten most influential citizens in Stevens Point’s history, as determined by popular vote during the city’s sesquicentennial celebration in 2008, over the course of a 13-mile loop ride. The Tiny Museum Ride rode 8 miles to visit three tiny museums, all different from those visited during the version of this ride two years ago. 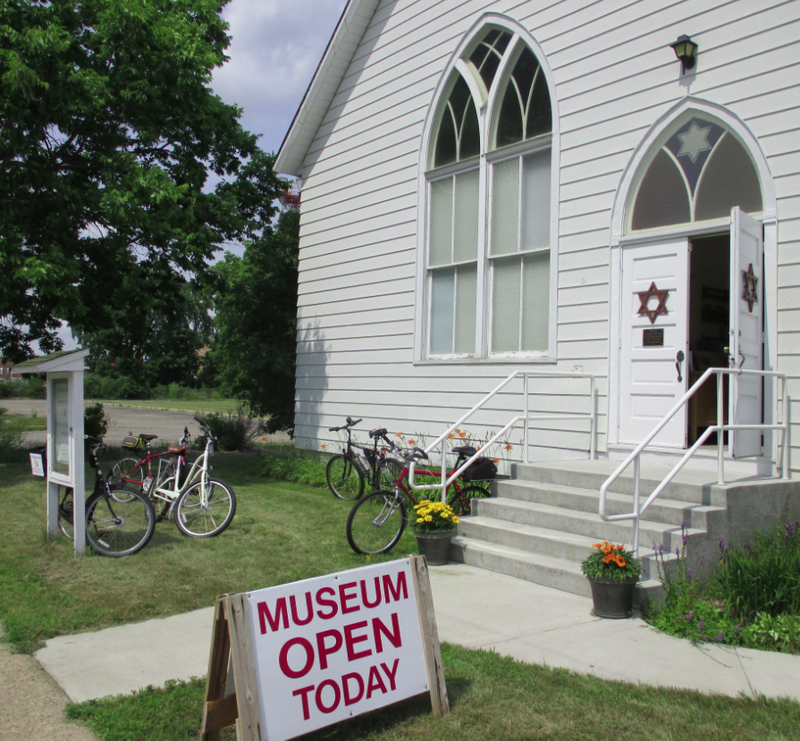 This time, we visited the Conservation Hall of Fame in Schmeeckle Reserve, the Synagogue Museum operated by the Portage County Historical Society, and the Dorothy and Jacque Vallier collection of early American pressed glass goblets in the Noel Fine Arts Center on the UWSP campus. 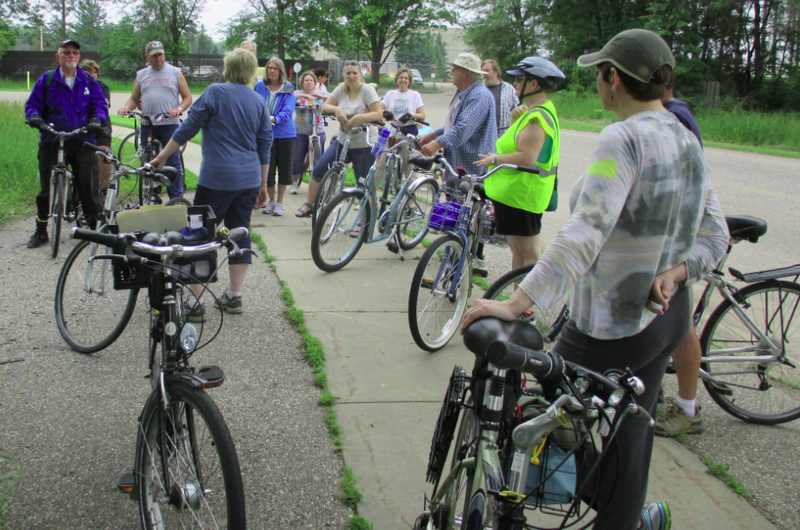 The Bike/Ped Plan Vision Ride visited numerous locations in Stevens Point and exposed Poky Pedalers to different types of biking and walking accommodations recommended by the recently adopted Portage County Bicycle and Pedestrian Plan. We visited burial mounds in Whiting and learned of their cultural importance to native people whose ancestors have inhabited this area for thousands of years. Food was another prominent theme in our Bike Fun this year. 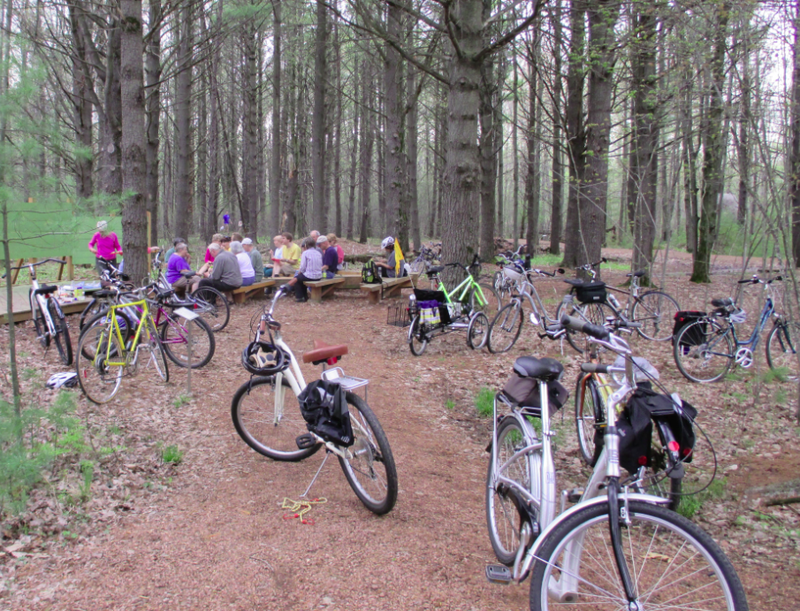 Besides Poky Pizza Pedals and the Chocolate Ride mentioned earlier, another season of monthly Poky Pedaling Potluck Picnics enabled Poky Pedalers to share delicious food contributions in splendid parks that were a 3- to 5-mile ride from our starting location. 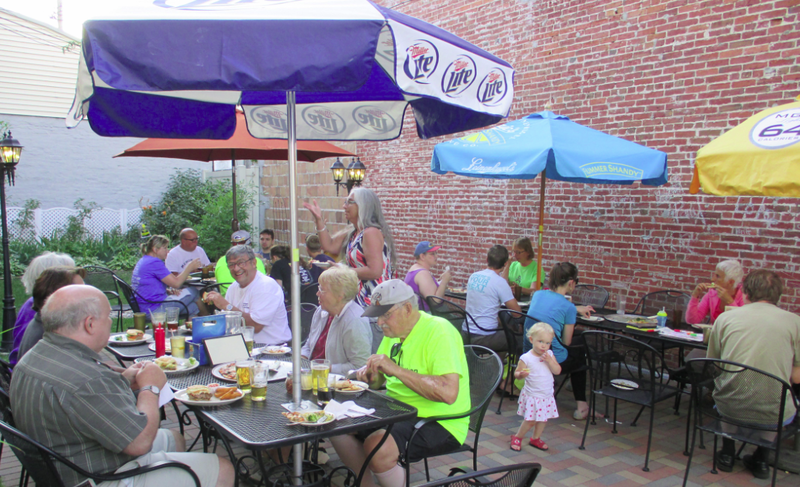 The settings for this year’s picnics included the Stevens Point Sculpture Park, a gazebo on the UWSP campus, and one of Iverson Park’s massive stone shelters. 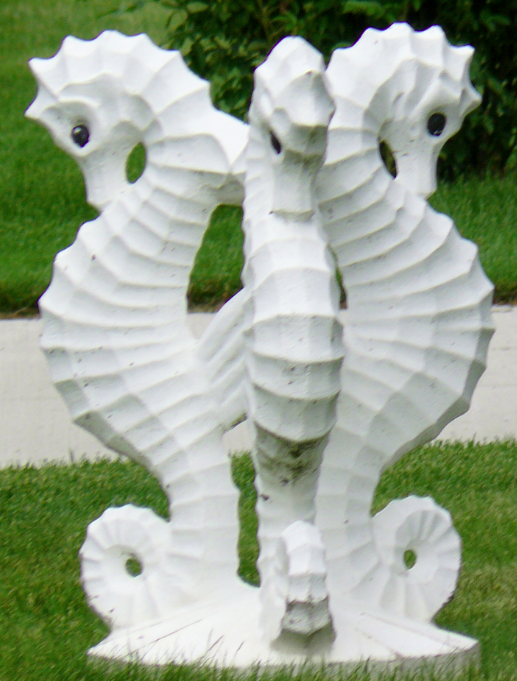 One fun discovery made during the Poke-Around Ride was the many triple seahorse statues in front of homes throughout the Village of Whiting. This is undoubtedly the unofficial lawn ornament of Whiting. PPSP recommends that the village add the triple seahorse statue to its flag as an appropriate tribute. All this is merely a sampling of the immense amount of Bike Fun shared with PPSP throughout 2014. Poky Pedalers can read all the Bike Fun Reports from this year’s Poky Pedals via the links on the 2014 Bike Fun Calendar. Turning thoughts to next year, I have already been quite active in putting together the 2015 Bike Fun Calendar. Poky Pedalers can look forward to more Poky Pizza Pedals and Poky Pedaling Potluck Picnics among next year’s Bike Fun. Other Poky Pedals will provide opportunities to learn a bit of regional history, enjoy our scenic neighborhoods, and discover the whimsical side of our urban area. There might even be a Bingo game incorporated into one of our Poky Pedals! I am also considering a few new PPSP features for next year: a regular dessert ride of some sort and PPSP-themed bicycle “bumper” stickers. As much Bike Fun as we’ve shared in the past, we’ll be taking it to a new level next year. Hang on to your handlebars. The 2015 Bike Fun Calendar will be available on the PPSP website in early April, the first Poky Pedal will be in mid-May, and Bike Fun will continue into the fall. In the meantime, I’ll continue to post bikey news of interest to Poky Pedalers on both the PPSP blog and Twitter feed. I hope Poky Pedalers visit the PPSP website regularly over the next several months to be reminded of all the past Bike Fun we have shared as well as to anticipate all the Bike Fun to come in 2015.